The roots of the RV Industry can be traced to way before 1910, it's official birth date. People have been moving from place to place since almost the beginning of time. A love for camping and traveling is deeply embedded in our DNA. On this page I am going to take you on a journey, to show how the RV industry has roots that date back to near the dawn of time. I might be be taking this a little far, but think about it, what is the RV lifestyle anyway? 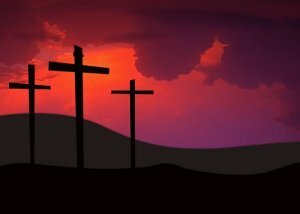 In the Bible we meet Abram and Sari (later Abraham and Sarah) a nomadic couple who moved from place to place with everything they own. We are told they had many possessions, I can imagine they used carts to move from place to place. I know they slept in tents, cooked over an open fire and spent most of their time outside. There are many stories like this one throughout history that show the movement toward today's RV lifestyle. Now let's look at the true predecessors of the modern RV. The covered wagon appeared on the scene in 1745. 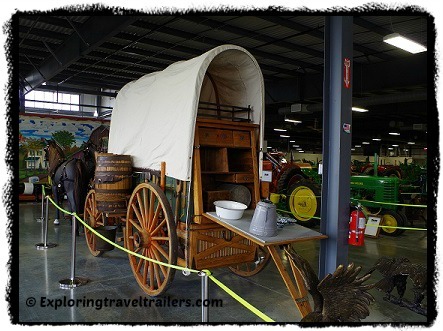 Many wagons had living quarters as well as a place for all their supplies and equipment. This almost sounds like today's toy haulers. These wagons continued to be used right through the 1800's and were instrumental in the western expansion of the United States. 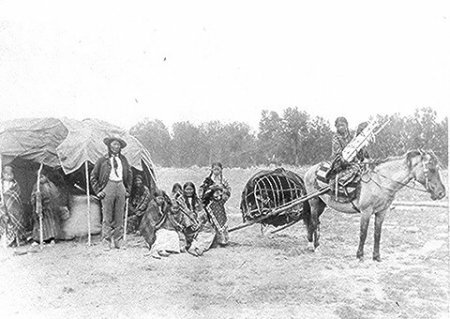 "From my experience, my family and I rode in one in the great ruts of the Oregon Trail. Needless to say, it was not a pleasant experience, and now I know why this industry has evolved to what it is today." 100 years before 1910 and the birth of the RV industry, wagons were being built in France that were intended to be living quarters. These units were used by circus performers and showmen in Europe. They were exported to the United States where they were used by traveling salesmen, traveling preachers, etc. Melissa's great, great grandparents had a traveling picture show business in the late 1800's and traveled in one of these wagons. I will share a few of the original pictures from my Great, Great Grandparents and the Traveling Picture Show back in the 1930's. My Grandmother and her twin sister always used to go help out with it when it was touring. What a fun job that would have been! They have some stories behind this...would that ever been so neat to see in action! "I believe this is where my love for travel trailers came in!" A New Century With New Possibilities. The early 1900's were an exciting time. The industrial revolution was in full swing, new inventions that made life easier were showing up in full force. One of the most notable inventions was the horseless carriage, also known as the automobile. With the advent of the automobile, came increased mobility. For the first time people could travel greater distances in shorter times than they did before. It didn't take much time for many adventurous folks to figure out that they could put their gear in the car and head out on a camping trip. Not too long after that, they realized they could put a hitch on the car and attach a cart to the back, load their gear and go. These were still basically horse dawn carts with wooden wheels that could not handle the higher speeds of 15-25 miles per hour over the rough roads of that day. To remedy that, the owners replaced the wooden wheels with the new more sturdy automobile tires. As the vehicles evolved through the first decade of this new century, a few people realized they could convert their vehicles into house cars by building wood structures on the chassis and placing beds, kitchens, and seating areas in the cab. Obviously, those with vehicles at this point were usually in the wealthy class. But as the first decade of the new century was about to come to a close, things were about to change that would bring greater mobility to the masses. 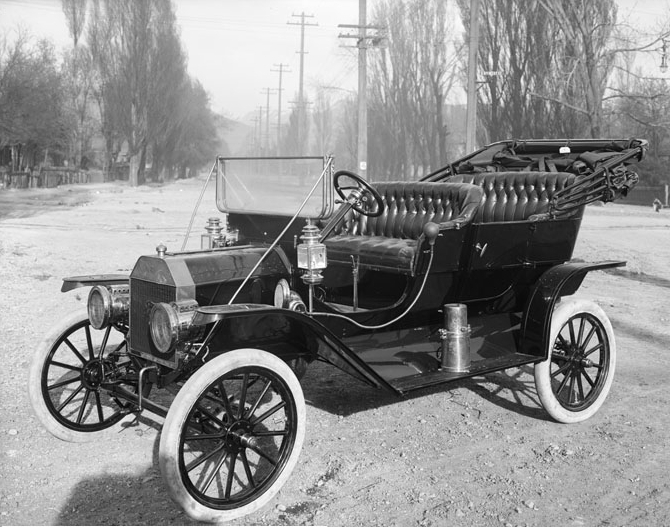 In 1908, Henry Ford invented and manufactured the Ford Model T. This was the first mass produced vehicle that was priced for the average person to afford. 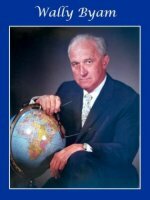 Mr. Ford's new product forever changed the landscape of travel in these great United States. He also allowed for the birth of the new RV industry that was not present before 1910.